I’ve been sick off and on since Christmas. For the most part it’s been just a head cold, but it seems that as soon as this one clears up, another one takes over. Then to top it off I got bronchitis. With my medical history getting bronchitis is something I don’t get over quickly. Today the sun came out and the temps shot up to a balmy 45 degrees and i decided I need to get out and do a little birding. I drove to both Caesar Creek and Cowan Lake State Parks to check out the water fowl. And much to my surprise I found good numbers and varieties. One of my usual stops is Harveysburg Road, but do to the awful winds we’ve been having the road was blocked by a fallen tree. The ice was breaking up which left some nice pockets of open water for the ducks to congregate in. For the most part the Gulls kept either to the beach area (which was under water due to all the rain) or out on the ice roosting. I was able to pick out a lone female White-winged Scoter which was the bird of the day, but what really impressed me were the Common Goldeneyes which were doing their courtship display. It would have been nice to get some photos of the birds but they were so far away any pictures we’re out of the question. But it was while I was at Cowan Lake I noticed a lone Horned Grebe fairly close to shore. They were actively feeding on small fish and I couldn’t help but be mesmerized by the Grebe. I must have watched for an hour as I jockeyed for a better position to get a good photo. Concentrating mostly on water fowl, I’m just listing the different species seen today. There are 3 species of North American Scoters, the Black, Surf, and White-winged. 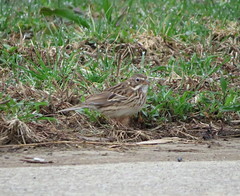 For us in Ohio they can be a common bird seen mostly on Lake Erie. They do wander south of the lake but with usually with irregularity. Last year for instance during my January 100 Species Challenge I was able to tick off both Surf and Black Scoters at a Metropark in Dayton. And towards the end of this year the northern half of the state is seeing the most of the 3 Scoter species. However the day before Thanksgiving I noticed a small sighting post on our local bird watching Facebook page of a Black Scoter at the beach at Caesar Creek State Park. This really peaked my interest since Black Scoters are the rarest of the 3 in my opinion. But with the holiday staring me in the face with those last minute preparations I was unable to chase this bird till yesterday. My first stop however was Cowan Lake State Park to check out the reports of a pretty reliable Long-tailed Duck that was seen on some sediment settling ponds that were being used for all the dredging that’s going on at the lake. I dipped on the duck and later found out that it was scared off by a Bald Eagle and never came back. So after Cowan Lake I made my way of to Caesar Creek and hope for better luck. I parked my car and approached the south half of the beach. After 100 yards I set up my scope and started to scan. Nothing as I scanned from the north to the south. The sun was still rising and the glare on the water really burned to retinas. A I continued to scan towards the new marina I saw one lone bird on the water. This really couldn’t be the Black Scoter, could it? As I moved closer to the lake with a better angle out of the sun I was able to get my scope on the bird. And indeed it was a Black Scoter. I stayed with the bird for about 50 minutes as it moved the length of the beach, and me trying to get a closer photo. 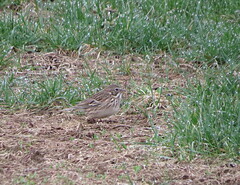 Despite all my efforts this distant shot was all I could get of what I think is a great bird. The beauty of retirement is revealing itself as I start to take advantage of some of my favorite pastimes, like birding anytime I want. I drove to Caesar Creek State Park to check the beach and the local gull flock to see if anything might show up a little unusual. To my surprise the beach was void of any gulls. They were all roosting on a temporary dock located a couple hundred yards off the beach. So I started to scan the beach and pick through all the Killdeers when I noticed 1 lone “Peep”. This one bird had my total focus for about 30 minutes as I positioned myself against the glare of the rising sun. It may be only a Least Sandpiper, but the fact that it was all alone on this near empty beach drew me to it. I took dozens of photos, but I choose this one because of the way the sun hits it, and the contrast between the bird and the green stuff it was feeding in. First things first before I get to my blog post about cute sandpipers, I’m finally retired. After 40 years as a Surgical Technician at the same health care facility I’ve punched out for my last time. Which in turn should free me up more birding, and chasing rarities. So hopefully I won’t be so lazy lately in getting blog posts out to all my readers. So when you think of cute Sandpipers there’s quite a few that come to mind. But first let’s make sure we’re on the same page when it comes to Sandpipers. There’s a lot of cute birds that scurry about along everyone’s favorite beach or lake front. So let’s omit some of these. This little cutey is a Snowy Plover which I found at Gulf Island National Seashore. Now you have to admit that is this one cute bird, however it’s a Plover. The same holds true to this gorgeous with loads of cuteness to boot. This Piping Plover was photographed at Sleeping Bear Dunes, and the cuteness, and rarity factor is definitely there, but once again it’s a Plover. Now here’s a picture of a legit Sandpiper, a Purple Sandpiper seen back in 2013 at East Fork State Park. Now this is a great bird, however when it comes to being a cute Sandpiper, ………..well? Now this heavily cropped and terrible photo is of a Stilt Sandpiper. A reasonably cute Sandpiper in it’s own right, but once again there are cuter Sandpipers out there. Now this Dunlin is a Sandpiper even though it doesn’t have Sandpiper attached to it’s name. And it’s a plump very cute bird with a lot going for it. But alas not the cutest. Now this Pectoral Sandpiper and Lesser Yellowleg are very cool, and quite honestly they are cute, but not enough to be called the cutest. Now breaking into the top 5 of cute Sandpipers is this Semipalmated Sandpiper seen the same day as the above photo of the Piping Plover. This is one cute bird, and his next of kin is also very cute. The Least Sandpiper with it’s distinct yellowish/ green legs. Seen along both coasts and the Gulf of Mexico, the Sanderling is everyone’s little darling of the beach as they search for food as the waves crash ashore. Always on the move, they can be approached if your quick enough, and getting a decent photo on these fast moving bird is always a challenge. And I would have to agree with most people in saying this is a really cute bird. The Buff-breasted Sandpiper, is quite honestly the cutest Sandpiper. This gorgeous bird was first reported at Caesar Creek State Park this last Saturday, and stuck around through the evening. Very rare except during migration, I couldn’t wait on this bird any longer. So on Sunday after I went birding with Jon, and we saw yet another Buff-breasted at Lost Bridge, I raced up to Caesar Creek to look for that one. The day was sunny, with the sun hitting the bird at the right angle. the beach was busy with people on this beautiful Sunday, but the Buff-breasted wasn’t bothered and busily feed along the shore. To me they appear as small and fragile bird, with a small head with that beautiful coloration. Very distinct markings on the back with those nice yellow legs. All told I took over 120 photos of this bird. But when you’re the cutest Sandpiper you don’t spare the SD card. The Brant, (Branta bernicta) particularly the “Atlantic” sub-species is roughly the size of a Cackling Goose an breeds in the Eastern Canadian High-Arctic region of North America. During Fall migration they’ll stage in the James Bay area, and continue their southward movement where flocks will be seen at Lake Champlain and from Appalachian hawk watch sites. 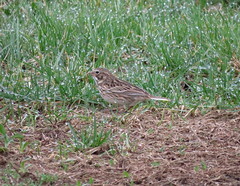 During the winter they can be found from coastal North Carolina northward to New England. And every now and then one multiple sightings from Northern Ohio, especially along Lake Erie are reported. For myself this is a semi-nemisis bird. I’ve chased Brants a few times when reports come in from the center of the state but with no luck. And most of the sightings from Lake Erie are of small flocks passing through the state on their way to the coast. And for some reason they just don’t show up in the southern part of Ohio, not that I was expecting any. Remember rarities are just that…rare. For the past couple days a Brant was sighted at Mosquito Lake State Park, north of Youngstown. That’s a solid 4 plus hour drive for a bird that could be there one day, and gone the next. Do I chase or not? As tempting as it is, I decided to not chase. Autumn chores needed to be accomplished and it was a beautiful, unseasonably warm day. Kathy and I dove into the yard work and after a few hours we had everything done for the day. Time to relax with an adult beverage. I went to grab my phone which was plugged in and saw I had a text from Jon. There’s a juvenile Brant at Rocky Fork State Park, which is on the other side of Hillsboro Ohio. The original sighting came as a group from the Cincinnati Bird Club were visiting the lake. That’s a little over an hour drive if I hurry. WHOOOOOOOSH……….. I’m out the door. My GPS takes me by the most bizarre way but after an hour of driving through farm country I arrive at the lake. It was sighted from the camp ground so I drove through and parked at the far end over by the lake. I grab my spotting scope and start to scan. Loads of gulls, but no Brant or a single goose. Now there were these large red, round buoys out in the lake and by the looks they were supporting this large cable that was stretched a couple of hundred yards. The cable must have been right under the surface of the water because loads of gulls were perched on it just like they were standing on water. I was scanning along the line of gulls when I saw the Brant. Now I would have loved for the Brant to be a bit closer without the sun in the wrong direction, but we sometimes have to deal with what we’re given. And for me I was given Life Bird # 445.